That made a catch in the breath – . Urban legend has it that the term “to be 86’d” derives from police busts during the days of Prohibition at Chumley’s Speakeasy. Cops would rush the bar yelling that the patrons were 86’d, referring to the bar location on 86 Bedford Street. Like rats, the tipplers would spill out a secret back entrance to escape capture and drink some more. About two years ago, Chumley’s was 86’d, not by the police, but by a devastating fire. 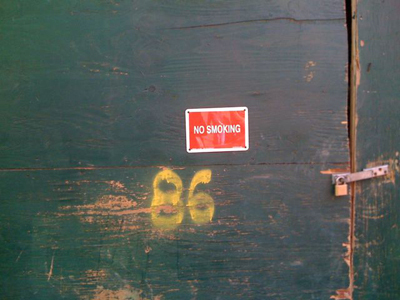 The No Smoking sign is an ironic comment on the bar’s fate. All that remains of this landmark bar is a charred husk of a building. I swear you can still smell smoke. Founded in 1928, Chumley’s quickly became a literary bar, like the nearby White Horse Tavern. F. Scott Fitzgerald, Eugene O’Neill, Edna St. Vincent Millay, Upton Sinclair, and Theodore Dreiser all drank at Chumley’s. William Burroughs and David Kammerer would often begin a night on the town at here. 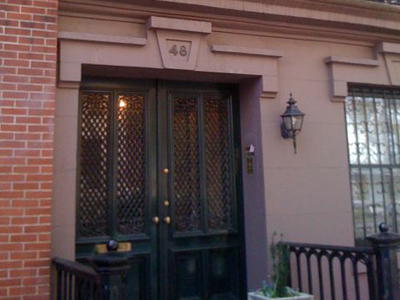 In 1943/1944, Burroughs lived just yards away at 69 Bedford Street and Kammerer lived just around the corner on 48 Morton Street. No doubt they were drawn to the bar by its proximity as well as its literary clientele, particularly hard drinkers such as Fitzgerald and O’Neill. 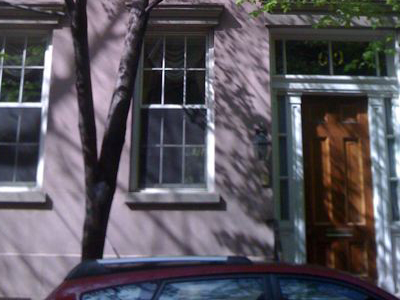 Chandler Brossard lived in the same building as Kammerer. Kammerer, Burroughs, and the Beat Circle provided the subject matter and tone for Brossard’s novel, Who Walk in Darkness, which is often named at the first Beat novel. 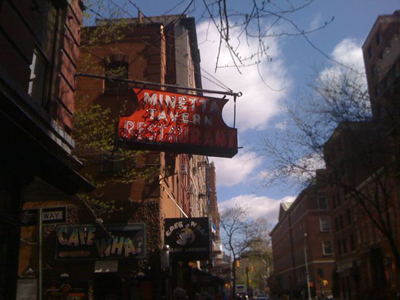 A few blocks away is the Minetta Tavern, which along with the Café Wha? is still in operation. Kerouac, Burroughs and Ginsberg drank at the Minetta rubbing shoulders with the legendary Joe Gould. No doubt they saw Gould perform his seagull act and recite selections from his mysterious masterwork, An Oral History of Our Time. In And The Hippos Were Boiled in Their Tanks Burroughs and Kerouac mention Gould holding court in the Minetta. Joseph Mitchell, who also immortalized McSorley’s, later revealed Gould’s secret that the masterwork was all talk, no text. Established writers such as e.e. Cummings and Ezra Pound hung out at the Minetta in the 1930s, thus drawing young dreamers like Kerouac like moths to the flame. Kammerer’s house was typical of the lower class of village residences. There was no porch — a few steps led to an iron grated door. Lucien entered this and went to the dirty antechamber. He pushed a large glass double door at the other side. . . Kammerer’s room was low ceilinged and large. On one end was a Venetian window that looked over a can-littered courtyard. A small writing table leaned against the wall at the end of the window. At the other end was a beaten white icebox, with no ice in it; through its open doors could be seen empty soda and whisky bottles. Near the icebox was a sink littered with bottle openers, a loaf of half-eaten white bread, a knife, and strands of red hair. The sink was separated from the rest of the room by an ugly black partition which wavered precipitously over a collapsed but comfortable single sofa. Against the adjacent wall was a large open fireplace packed with newspapers, half burnt wood, cigarette butts, and bent burned wooden matches. On the top of the fireplace was an open copy of Rimbaud in which was placed a small drawing of a dark windswept, swirling sea with a whorled rock jutting out of the waves. As recounted in Hippos, on that fateful night Al and Philip drink at the Minetta, not uptown near Columbia University. The murder occurs in the Village. Philip then walks to Dennison’s apartment. That much is true to life. After Carr 86’d Kammerer in Riverside Park and dumped the body into the Hudson, he showed up at 69 Bedford Street offering Burroughs a cigarette from a bloody pack. Burroughs advised Carr to go to the police. In the months leading up to the murder, Ginsberg and Kerouac often came downtown from Columbia to Burroughs’ place to be initiated into the black magic of Oswald Spengler, Rimbaud, the late Yeats, and Céline. Kerouac wrote in The Vanity of Duluoz that gatherings with Carr, Kammerer and Burroughs are where he got his “first glimpse of the Real Devil” and, as Ginsberg noted in his early journals, called Burroughs himself the “authentic devil.” Carr already knew Rimbaud by heart. In fact, he took the demonic Frenchman to heart by playing a Rimbaud/Verlaine pantomime with Kammerer. This triangulation of Chumley’s/69 Bedford/48 Morton forms a psycho-geography of the birthplace of the Beat Generation with the burned out Chumley’s serving as the dark tower marking those hellish nights of the summer of 1944. Written by Jed Birmingham and published by RealityStudio on 10 May 2010. All photographs by Jed Birmingham. if those places could talk, and of course they do just that. the short paragraph from ginsberg alone is better than all the drivel i’ve read from his self appointed critics. an evocative snapshot from those formative years, and the tragedy that occurred.